The original Smoky Mountain Alpine Coaster is located on Wears Valley Road in Pigeon Forge, TN. This is also the longest coaster ride in the Smokies which challenges you to "ride the hill and feel the thrill". You begin your journey at the bottom of the hill where you load-up on the coaster. You can ride single or double. The coaster rides on steel rails and you are pulled to the top of the hill, then gravity takes over. You can fly down the track or control your speed with the handbrakes. You will drop over 360 feet and can hit speeds of 27 miles per hour! The track has curves, dips, circles and straight-a-ways to give you a thrilling ride down a mile of track. You can ride the Smoky Mountain Alpine Coaster at night too. The track is lit up with colored lights and the night ride has a completely different feel than the daytime ride. You must do both! After your ride you can browse the gift shop and purchase your souvenir picture or a hat, T-shirt or other goodies. 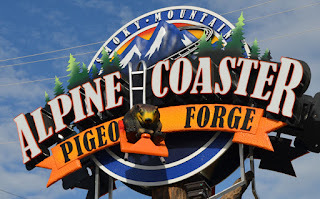 Find out more about the Smoky Mountain Alpine Coaster and other Smoky Mountain attractions at the Best Read Guide site at www.bestreadguidesmokymountains.com, where you can also get directions and coupons for attractions, restaurants, accommodations, theaters and shopping.